Radovich is the leading scorer (17.3 points per game) on a well-balanced team. 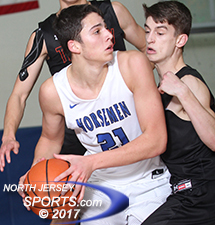 He can score inside, use the mid-range game well, or hit big threes as evidenced by his game-winning shot against Hackensack in the Bergen County Jamboree quarterfinals. 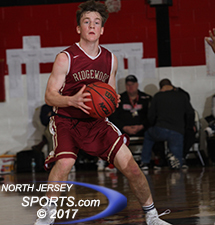 The Cougars will need him to rebound from a tough game against Don Bosco Prep in the Jambo semis and be the player he’s been all season if they want to win a section title. No team possesses more size and more physical play than the Knights. They have a trio of football players who also excel on the hardwood. Bruisers Matt McElroy and Dan Ruiz control the inside along with 6’5” Ryan Picinic. They present matchup problems for whatever team they play. The Knights come into the states on a three-game losing streak but have the chance to make up for that with a few state tournament wins. This will be a classic matchup between the two blue bloods of Bergen County Group 1 basketball. 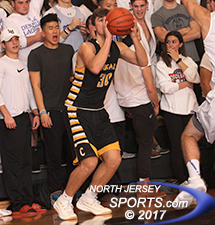 After being the feel good story all season long, Cresskill has finally faced adversity with a blowout loss to Don Bosco in the Jambo semis followed by an upset loss to Dwight-Englewood in the NJIC Tournament final. With this being the last shot at being a championship team, look for the Cougars to pull it together and win a nailbiter in the section final. Pepin is a superb athlete who has been a force this year and can play above the rim. A senior forward that can score in bunches regardless of what defense is thrown his way and can also step back and hit open shots from the perimeter. His presence alone makes the Rams a team capable of making a deep run. Although the regular season has been a solid one, it did not live up to expectations with several players returning from a team that lost by two to the eventual section champion, Newton, in the section semis. Dallas Hoffman is a streaky player who can take over with the game on the line. This team is a complete enigma this season and the state tournament will be the measuring stick whether this season was considered a success or not. This will be the third meeting between these two teams, so they know each other quite well. Ramsey has won five out of its last six games, starting with a win at Westwood. It will be very difficult to beat a good team twice in their own gym but the Rams have the size to make it happen. Kevin Mullane and John Carroll provide a nice 1-2 punch inside and the Rams have just enough guard play to win a low-scoring overtime game and a section title. Runyon is the Norsemen’s leading scorer and rebounder. The offense runs through the senior forward and he has the ability to dominate in the paint, even against the top teams in this section. Don’t let the seeds fool you, Dwight Morrow is as talented as any team in this section. They have all the pieces to make a run at a title. A shooter like Owen Roberts, heady guard play in Martini Martin and Drew Tyre along with a 1,000-point scorer in George Garrison who is athletic enough to guard anyone. If this team gets rolling, look out. With electric two-guard Ryan Starr and backcourt mate Kevin Griffith able to match virtually any backcourt in this section, the difference in this game will be 6’10” Neal Quinn. If he is aggressive each trip down the floor, he will make his mark and lead the Highlanders to one of the bigger upsets in state tournament play this season. Senior guard Jason Oppler and junior KC Hunt have been a solid scoring tandem all year for the Green Raiders as two players who can take over a game at any time. But it has been other players like John Whooley and Vasili Econopouly that have been consistent contributors and not just in the scoring department. High-scoring, defensive struggle, or anywhere in between, Ramapo is a team that can beat you playing any style. That always helps come state tournament time. Carver may not be the most well-known name out of all the top-notch players in this section but he is as valuable to his team’s success as anyone. A quick point guard who can knock down open shots, shoot well from the foul line, defend, and take care of the basketball always thrive in state tournament play. Bergen Tech is as dangerous of a No. 12 seed as there is in all of New Jersey. Marc Martinez is a guard who can do it all and Andrew Yoon is a dead-eye shooter from beyond the three-point line. Howell Nunez and Firas Khansa will have to give them contributions both in the scoring column and on the boards. If that happens, the Knights have the potential to make a run to the section final. PCT has had a sub-par season but has also been competitive in games with some good teams this season. With nothing to lose and the athleticism to cause problems on both ends of the floor, the Bulldogs can pull the massive upset if they put it all together. BJ Saliba has steadily improved his game throughout the season and can put up 30 on anyone in this section if he’s rolling. The question will be the health of Atiba Taylor, who has been out recently with an ankle injury. If he returns to full form, the Comets will be tough to beat. After getting upset by Cresskill in the Jambo quarterfinals, the only redemption for Hackensack is to win this section. That will be a motivating factor moving forward. No player in North Jersey has the size-skill combo quite like Earlington. The 6’4” forward owns the paint and feasts on the offensive glass. When he starts strong there is not much even talented teams can do to slow him down. The Marauders have quietly had another solid season under head coach Alex Mirabel. Army-bound Brendan Thiele is a sniper from long-range who uses his 6’4” frame to shoot over the top of smaller defenders. Shayne Simon is an exceptional athlete who can guard anyone and also score with his mid-range game. Seton Hall Prep, Bergen Catholic, and Don Bosco Prep are considered head and shoulders above the pack in this section but the Marauders are not that far behind. After winning the Jambo in 2017, the Ironmen ripped through the state tournament to advance all the way to the Tournament of Champions final. Earlington and Ronald Harper can match up with anyone in this section. Look for point guard Michael Concannon and 6-foot-5 swingman Matt Herasme to make big plays late as the Ironmen repeat as section champs. The Syracuse-bound Carey is a silky smooth ball-handler who can carve up opposing defenses all by himself. He has developed a more consistent three-point shot and averages over 21 points per game. In a rugged section, stellar point guard play is a must to make a run. 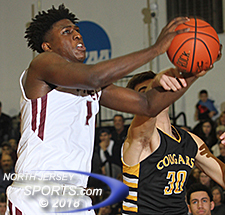 With a recent win against Seton Hall Prep, the Lions made their first Essex County final appearance since 1961 and showed they can play with anyone in the state when Carey is on his game. The Bulldogs have quietly had a fantastic season led by Jordan McKoy. 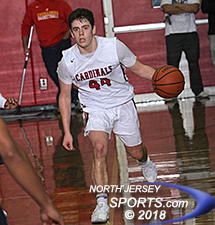 They have won 15 out of their past 17 games with the only losses in that stretch coming to this year’s Bergen County Jamboree finalists, Don Bosco and Bergen Catholic. 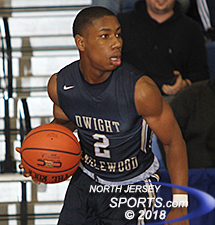 With an upset win over Cresskill in the NJIC Tournament final, Dwight-Englewood is peaking at the right time and is capable of winning two or possibly three games in the states. The semifinal game between Roselle Catholic and Hudson Catholic could just as easily be the Tournament of Champions final. The winner of that game will likely be the favorite to be crown T of C champion when all is said and done. No team in the state can match the trio of Villanova-bound point guard Jahvon Quinerly, Ohio State-bound combo guard Luther Muhammad, and Oregon-bound big man Louis King. But keep an eye on the guy who covers all the intangibles, senior Danny Rodriguez. That combination of talent will be too tough to stop as the Hawks get over the hump and eventually win the T of C.